THEY say the world watched the race for America’s next President – but what about anyone else out there? 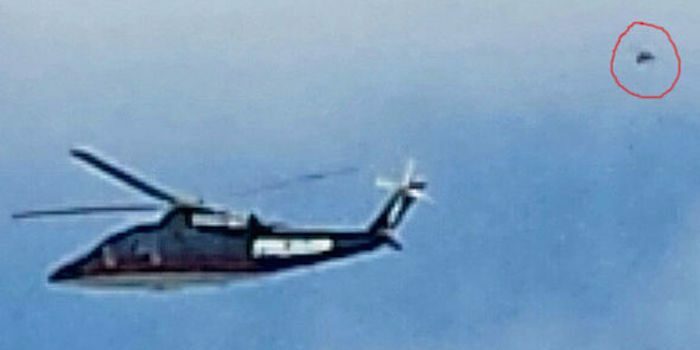 UFO spotters have been left wondering who or what was following Republican hopeful Donald Trump’s helicopter as it flew over a fair during his campaign. The snapper, who has not been named, captured this “blob” following closely behind the Trump Towers tycoon’s chopper as it flew a group of children over the Iowa state fair. The witness, who has reported it to a US national UFO database, said: “Donald Trump was at the Iowa State Fair giving kids a ride in his helicopter. “We were walking down the street to the fair. Donald Trump’s helicopter was flying overhead so I got my phone out and snapped a picture. The Iowa Mutual UFO Network, which records such sightings, branch is said to be is investigating. MUFON spokesman Roger Marsh said: “The object could be any number of things from a second helicopter to a bird.